Shrink tunnels using a heated air system, it used for shrinkable films (PE POF PVC) that have been applied by L-bar sealers, sleeve wrappers, and sealing cutters. Designed for high production, the air flow technology is used to circulate the air to avoid bubbles and bumps in plastic film. Independent control systems regulate temperature, air velocity and conveyor speeds, our shrink tunnels feature carefully controlled air velocity and temperature that are maintained throughout the tunnel for optimum film shrink. The efficient heating system on each machine reduces the amount of electricity needed to run the machine, consequently reducing operating costs. 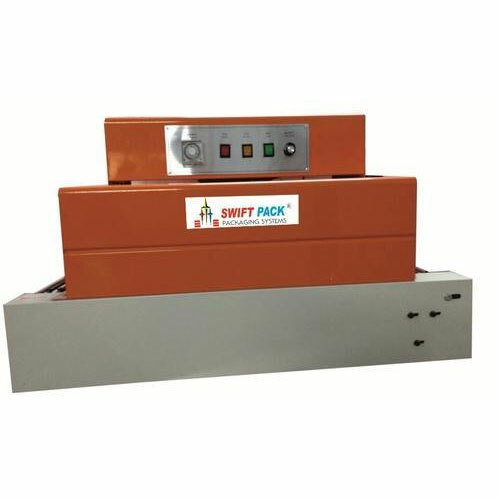 It is used to shrink pack goods, such as cans, glass bottles, mineral water etc, in wood, rolled steel, ceramics, household appliances, computers industries and more. Shrink tunnel Model SP3020,SP4525, SP4535L & SP 6535L adopts hot-wind & down-cyclone structure, intelligence temperature control and AC variable speed regulation. There are two optional conveyors, including Teflon belt type and roller type. Shrink tunnel are applied to heat shrinkable film such as PVC, POF, PP etc. SPS 1230 & SPS 1540Label shrink tunnel adopts hot air circulation for shrinking, is mainly used for shrinking labels of bottles, jars and cups etc, no matter the label is on the body, bottom or cap of the bottle. SPWS-6540Web Sealer Machine can be pushed manually or pneumatically. After the process of sealing & cutting, the products enter the shrink tunnel automatically.